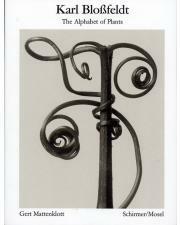 "Karl Blossfeldt's interest in the plant world was of an artistic and didactic nature: he was fascinated by the structure of plants, their organic configuration, and their lofty artistic form. He wanted to illustrate and compare in a photographic style that could be described as strictly objective, almost graphic. His goal was to to create a catalog of forms for the benefit of artists, artisans, and above all, architects. This then would provide them with a book of instruction and models to guide them in their designs." Plant life has for ever had a strong influence on blacksmith designs. From these pictures flows a forceful stream of inspirations also to the modern blacksmith. Karl Blossfeldt has done his part in that great examination of the perceptive inventory, which will have an unforeseeable effect on our conception of the world. Whether we speed up a plant's growth or show its form in a forty-fold enlargement in both cases a geyser of new images erupt at points of our existence where we would least expect it. Walter Benjamin, 1928 Karl Blossfeldt in the plant world was of an artistic nature: he was fascinated by the structure of plants, their organic configuration, and their lofty artistic form which he wanted to illustrate and compare in a photographic style that could be described as strictly objective, almost graphic. His goal was to to create a catalogue of forms for the benefit of artists, artisans, and, above all, architects, providing them with a book of instruction and models to guide them in their designs.